I've been thinking about the cloud in education for some time, hence my posts about Google Apps for Edu or Microsoft 365. So it was with interest that I read this blog post by Matt Britland titled "What is the future of technology in education?" In the post Matt proposes that the future of technology in education "is in the cloud". I tend to agree with nearly all that he says in the post. Freely available core tools available from any device, anytime, anywhere. Alongside online storage in the form of Google Drive or Skydrive. As Matt says, schools "will not need software installed, servers or local file storage." I'm sure certain large cost savings can be made by schools, along with removing the stress many of them feel in trying to maintain and upgrade a traditional server network. If a school also looks at the option of subscribing to some online content or tools providers that support specific areas of the curriculum, filling in any gaps in coverage, then most of the ICT tools for a school (especially a primary school) are covered. BYOD becomes easier to manage. Devices don't have to be connected to the schools internal network, and the security issues associated with that. Any web enabled device could be brought in and connected to the internet to access the relevant tools and services through an appropriately filtered connection. Everything delivered through the web. Sound wonderful, yes? However, the caveat to working this way is that schools will need a robust, resilient and reliable infrastructure, along with a quick internet connection. I'm currently visiting primary schools around SE Wales and infrastructure and internet connectivity is a concern of many of the schools. It is very difficult for me to engage head teachers in conversations about how technology can enhance learning and teaching, help improve their organisation and management processes, when the technology is just so unreliable or doesn't work. Hopefully the Learning in Digital Wales (LiDW grant) from Welsh Government will deliver some of the necessary infrastructure improvements needed to local authorities and schools. "We want Wales to be a world leader in digital learning, therefore we need to be able to offer our schools fast, consistent and reliable broadband services," said First Minister of Wales, Carwyn Jones. We certainly do. In the autumn term the Welsh Government will begin its roll out of the Hwb+ learning platform to schools. 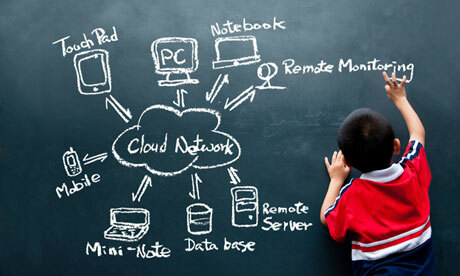 Lets hope all our schools are in a postion to maximise the potential of working in the cloud.